Benjamin took his first tentative steps in karting in 2004, aged six. He participated in ADAC club sport events, using a slalom kart. Benjamin raced on a circuit just one year later. He lined up in the Easykart class at Ampfing and Rottalmünster in Bavaria, achieving solid results. With the agreement of his team, Kartshop Ampfing, he then moved up to the much more powerful junior kart class. Apart from having a larger chassis, the kart also had more than twice as much power. So, the years 2008 and 2009 were filled with numerous test outings in Germany and Italy. Benny contested his first international KF3 class race at the age of twelve. He competed in the Ampfing Club Sport Championship and in the South German ADAC Kart Cup with Kartshop Ampfing. Another big step in Benjamin’s career followed at the start of the 2011 season when he became one of the youngest drivers to participate in a Formula BMW Talent Cup test weekend. The youngster learned the fine art of single-seater motor racing on the grand prix circuit in Valencia, Spain. After this first experience in formula motor racing, the focus returned to karting in 2011. Benjamin lined up in the KF3 class in the ADAC Kart Masters. Entry into the Formula BMW Talent Cup was planned for the 2012 season, but a change to his racing license at short notice was not possible due to his young age, so Benjamin was unable to take part. Now almost 15, he shone with second fastest time in the shoot‑out held at the Red Bull Ring by the BMW Motorsport formula racing entry level series, proving his suitability for a move up into single-seater racing. Further tests followed, including a test drive in Formula Renault. After a year’s training with Mücke Motorsport, Benny contested his debut season in the ADAC Formula 4 in 2015. He demonstrated consistent performance in a highly competitive field that often included more than 40 entrants and gained valuable open-wheel racing experience. This was followed by the successful advancement to touring car racing. In his debut race at the legendary Nürburgring Nordschleife Benny took the victory in the BMW M235i Cup class of ‘RCN Rundstrecken-Challenge’. Strong showings in the ‘VLN Langstreckenmeisterschaft’ ended the season on a high. The year 2017 started with a podium in a KTM X-Bow GT4 – a perfect gift for his 19th birthday, which was a great achievement in a strong field of drivers with 100 cars. Later on in the season, he made his debut in the highly competitive GT4 European Series Northern Cup. He regularly impressed with strong qualifying performances and made two podium appearances in his class, but on too many weekends, he failed to achieve the results he deserved due to technical problems or no-fault collisions. In 2018 Benjamin had the most stressful season of his motor racing career and yet at the same time, it was his most successful and ended with an extremely dramatic finale. He fought for the championship title in the GT4 Central European Cup until the very last race of the season. Benjamin lined up in Reiter Engineering’s KTM X-Bow GT4 and they had an excellent season together. He and team-mate Korpivaara were in contention to win the title in the Pro-AM Cup right from the start during a season made up of five race weekends in all. Benjamin had even virtually taken the lead in the championship in the final race of the season when their KTM X-Bow GT4 sustained damage, putting paid to their title aspirations with just a few laps to go. He finished the season in third place overall. Still, he went on to experience more success, taking his maiden win in the VLN Endurance Championship on 23rd June during the third round of the season on the legendary Nürburgring Nordschleife. He won the SP8T class with his two team-mates, Uwe Ebertz and Manuel Amweg, in the BMW M4 GT4 prepared by Team Pixum Adrenalin Motorsport. He followed that up with second place in the CUP X-Class during the seventh round of the VLN on September 22nd, driving Teichmann Racing’s KTM X-Bow GT4 with team-mates Thorsten Jung and Uwe Flaig. The GT4 European Series was known as the GT4 Europa Cup until the end of 2011. The Gran Turismo series was launched to give young talents a low-cost route into GT motor racing. The GT4 European series has been contested since 2014. 2018 the GT4 Central European Cup has been introduced. Drivers get the chance for spectacular wheel-to-wheel battles on five different tracks around Europe – including current and former Formula 1 tracks like the Red Bull Ring, the Nürburgring or Zandvoort. Drivers line up in GT4 racing cars such as the KTM X-BOW and numerous other brands. The races take place in the context of series like the Blancpain GT series and the ADAC GT Masters, attracting a large audience throughout Europe and gaining new fans at every meeting. Fans close up to the action and a wide field of starters. Featuring more than 170 racing cars, the VLN Endurance Championship captivates spectators with its furious racing action. 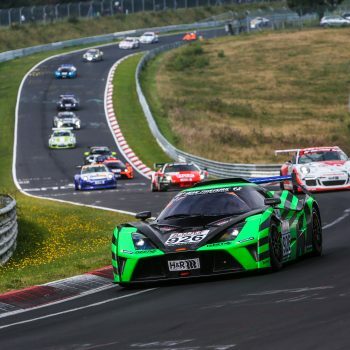 The popular racing series started its 42nd season on the Nürburgring Nordschleife in 2018.